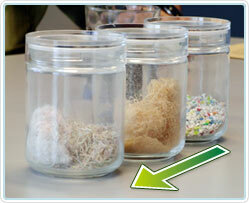 What's Ayako's Eco Cap Activity? 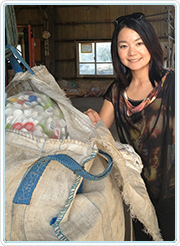 Ayako raises money by collecting and selling the plastic bottle caps consumed during golf tournaments and in daily life to recycling centers, and the sales profits from the caps are used to provide children's polio vaccines in developing countries. At golf tournaments, free water, sports drinks, and teas are provided by drink sponsors for players and caddies. This is really appreciating, but if you count all bottles drank also by tournament staffs, galleries, and volunteers, incredible amount of plastic bottles are being wasted. In 2008, my relatvie who is a school teacher told me about this eco cap activity and I thought right at the moment, "I can do this!" During training, I started asking people "Please give me the caps after you finish your bottle! ", then moreand more people started to give me the caps. It is wonderful to be able to help children in developing countries, but the best thing is how this wave of movement expands, and we all feel like doing something good for the world. 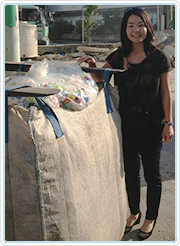 1) In December 2014, during her brief break Ayako visited Okinawa Ecological Cooperative Associastion to recycle the caps she has collected. 2) Ayako weighed the caps. This time 77,400 caps were counted and weighed 180kg, which can make vaccines for 90 children. 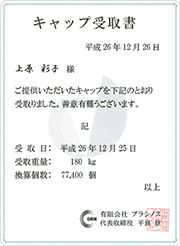 3) After weighing, the number is recored into the data sheet. 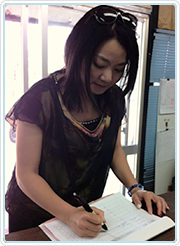 4) Ayako received the acknowledgment of the caps from the association. The caps sold to the association are then changed into various products. 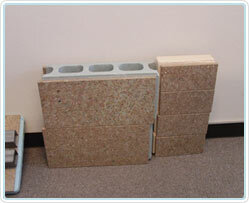 In this association, the chipped pieces of caps are reformed and reused in building materials. 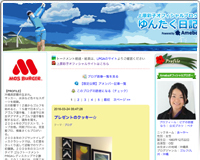 And by this reuse, we can save Okinawa's natural forest (Yanbaru) resources. Further more, by saving the forests, we can stop the runoff of red soil into the ocean, and lessen the artificial extinction of the coral reef.